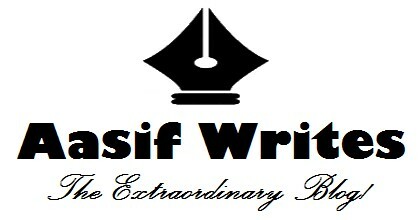 Aasif Writes | Sharing Experiences & Ideas! Speech — Launch ceremony of 'The Kashmir Radar' news portal! Esteemed guests and participants. Assalamu Alaikum! As you have been given a sneak peak by Dr. Ruheela Hassan into how important a role news media plays in shaping public opinion and strengthening our society, it is an opportune time to introduce our news portal. First of all. The present trend in local news media is to wait for events to turn into news so as to sell that to the public. Yes, I said "sell". That's because crime and violence are mostly read about as far as the consumption of news content is concerned. So we will be going against the tide by focusing on things like investigative journalism, ambush journalism, data journalism et cetera. There is a dearth of these genres of journalism as far as local media organisations are concerned. The second important issue that triggered our decision to launch a news portal of this sort is the growing menace of fake news. Whenever we scroll through our Facebook timeline, we see such posts which look like news but are as distant from reality as the earth is from the sky. WhatsApp is also a favourite network of fake news wallas to vent their frustration. And most people turn out to be their accomplices by forwarding their posts without verifying the sources. They don't have the knowledge either to recognize fake news. We will be ready to counter any such fake news with well researched articles and videos. We have two people in our team who will specifically deal with this menace in a professional way. And thirdly. Our district lacks a proper media representation. Should our be district be known only because of the turmoil here? We have some young and talented entrepreneurs here. People should know them and get inspired. We have some really beautiful places here. People should know and throng them. And at the same time, we also have some developmental issues that need to be addressed. All these things will be on our radar as well. On the occassion, I also want to make public the revenue model of our news portal. We will also be open to any donations by the local public. This is in the context that when advertisers pay advertisers are served and when the public pays, public is served. We will hunt down stories that people want to read about. That's possible only with the people's support. The valley of Kashmir is once again making it to news headlines in international media due to mass protests. Although this time the reason for such protests may be the incidents of braid chopping but then, anything that people here feel is a 'conspiracy' of the state or its agencies has the potential to trigger an uprising. The various voices from the government which supported the 'mass hysteria' theory have only worsened the situation. Few other voices which claimed "no one was behind braid chopping", suggesting the phenomenon as a by-product of black magic have only prompted people calling the government as 'superstitious'. In a highly militarised conflict zone like Kashmir where the security agencies including state police are in close proximity and jointly take part in anti-militancy operations, the inability shown and the desire "of a magic wand" expressed by Director General of Police, S. P. Vaid in order to nab the culprits has surprised one and all. This, I am sorry to say, is nothing less than a cruel joke! What the government has done instead is that it has also started 'chopping'. So, braid choppers have made the state government into an "internet chopper". 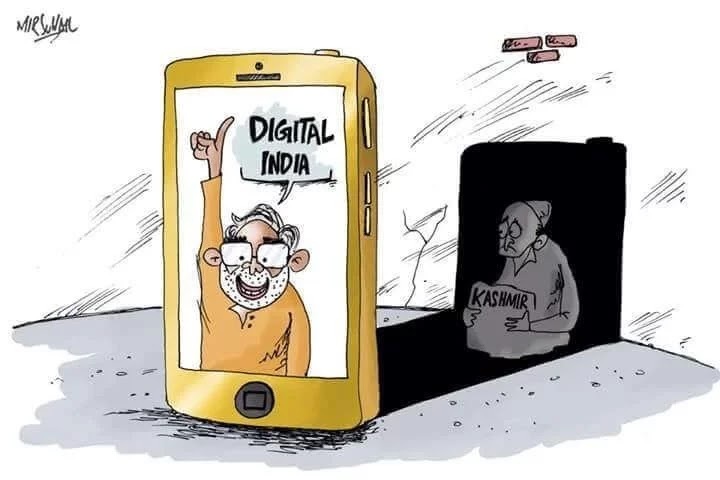 In fact, PDP-BJP coalition government's rule in Jammu & Kashmir has the honour of enforcing most number of internet shutdowns in the state that also in times of much boasted transition towards a cashless economy! The suspension of high speed mobile data services by the government has drawn criticism from all sections of society with people calling it an attempt to push the people back to stone age. Officials from the state police say that the suspension of 3G/4G internet is ordered due to fear of “law and order problem” in view of incidents of braid cutting. One of the officials from a telecom company called it a "new strategy" of the police to prevent people from uploading or sharing videos. However, this "new strategy" only serves the purpose of hiding their failure and inability in nabbing the braid cutters. These days, businesses are totally dependent on internet but the biggest hurdle that prevents them from flourishing in the state is these frequent restrictions. Many emerging entrepreneurs have already shifted outside, thus the state keeps losing economically also. While the promotion of Kashmir's tourism is being done at huge costs to the state exchequer, the tourists are often left disappointed when they experience the erratic mobile services. Again, ministers from the coalition government accuse Indian national media of running a negative campaign about Kashmir but then fail to ensure uninterrupted mobile services! The telecommunication companies operating in the state say that they have signed an agreement with the state government which gives the power to the authorities to regulate mobile calling and internet services. But the thing is that they are also obliged to provide the very services to their subscribers for which they charge them. Despite internet suspension, subscribers have to pay bills as per their monthly selected plans which is oppressive. Firstly, they face inconvenience of not being able to use the services and secondly, they are also charged! It is an irony that these service providers charge for high speed internet plans but provide data services that can't even be categorised as 2G. They even snap the services altogether whenever the authorities feel that bans can come to their rescue in so called 'law and order situations'. Internet is a tool of masses to appreciate and criticise governments and their policies. But in Jammu and Kashmir, the government keeps looking at internet through the prism of "security" & "law and order". There are certain chances that the internet may be used by anti-social elements in order to vitiate the already volatile atmosphere but there is law to tackle those elements. The frequent bans or slowing down internet speed is no answer as it means the fringe elements hold majority of people hostage. The state government needs to realise the seriousness of braid chopping incidents as soon as possible. The state police also needs to stop being apologetic for want of evidence and should make serious efforts to nab the culprits. Doing that requires moving beyond announcing hefty amounts as reward for information regarding braid choppers! We have a right to criticise the government for its insane policies through the medium of internet. But, only anger brews up when the very government bars internet on the one hand and flaunts "Digital India" on the other! Internet is undoubtedly the biggest fear that the coalition government needs to tackle! 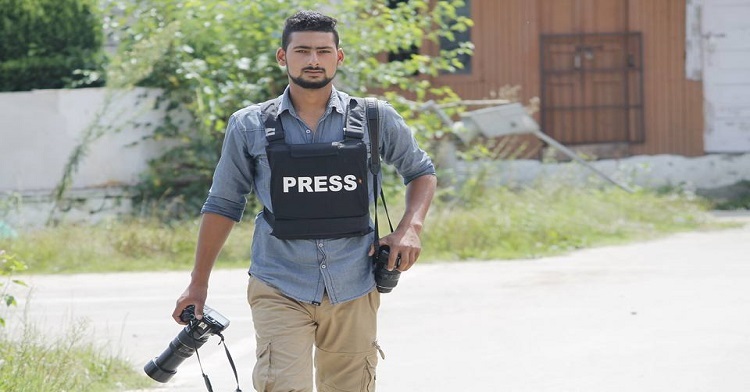 Photojournalist Kamran Yousuf was contributing photographs and videos to The Daily Greater Kashmir but after he was arrested by NIA on 5th September, there has been no word from GK on this issue. What the newspaper did the following day is just pathetic. The following news story was published on Page 03 of the newspaper which speaks volumes about GK's concern for its contributing member. The shame does not stop here. Infact, the newspaper even edited a previously published story which was initially titled as "Cops thrash GK lensman" but was changed to "Cops thrash lensman in Pulwama". While the news organisation was non-hesitant to use his work during the times when he reached encounter sites or covered the clashes between security forces and youth, they have preferred a radio silence on his detention. NIA is no less than a Gabbar Singh when a leading daily tries to save its corporation from unwanted attention of the 'investigating agency'. The following proof is clear to establish the fact that GK doesn't give a damn about its field staff who risk their lives to cover the conflict in Kashmir. The proof is that the newspaper edited the title of a story on 06 September, 2017. The story about Kamran was originally published on 04 March, 2017 with the title "Cops thrash GK lensman". The title now reads, "Cops thrash lensman in Pulwama". The screenshot for this story when searched on Google clearly shows that the story was published on March 04, 2017 with the title suggesting that The Daily Greater Kashmir owns this lensman and condemns his beating by the security forces. When we click on this search result and visit the page, we see a different headline altogether. Greater Kashmir removes 'GK' from 'lensman' in the title of this story. We land on a page that disowns the photojournalist! We read a story about the thrashing of a 'freelance' photojournalist! The webpage address (URL) now throws up a blank page as the story has been removed/deleted. But the e-Paper featuring the story is intact and is available HERE. However, there is one more story featuring the photograph shot by this 'freelancer' that GK needs to edit. I have provided the screenshot HERE. Come on GK, strip "Greater Kashmir" from "lensman Kamran Yousuf" in this story as well to leave him as a 'freelancer' or even as a 'stone-pelter'! Be quick, otherwise Gabbar will come! If the newspaper that featured his work doesn't stand up in his support, then who will? Oh! I forgot that even newspapers are banned by the authorities in Kashmir. Remember, Kashmir Reader was banned for months together for their reportage of incidents that happened in bloody summer of 2016. The ban, however, seemed to produce a good response as it led to the formation of Kashmir Editors’ Guild, established to create a new union of prominent editors of Kashmir’s newspapers. It was KEG's support that put pressure on the government to remove ban on the publication of the newspaper. In the case of young Kamran Yousuf, there has hardly been a statement from KEG. But why should KEG come out with a statement when it is headed by Fayaz Ahmad Kaloo as its president who is the chief editor of Greater Kashmir! A protest demonstration was called to protest Yousuf’s detention but it was attended by a very few people at the Press Colony in Srinagar. Most of the protesters that showed up at the venue were his friends from his hometown. It really hurts when we read about Kamran on propanganda monger portals like Times of India according to whom Kamran Yousuf "was known to be operating a WhatsApp Group from South Kashmir to orchestrate and spread violence across Kashmir valley." TOI's pandora box of lies goes on, "Kamran studied up to class 11 and gave up studies to join 'anti-India movement' through newspapers and by using social media," quoting 'a police officer'. The absurd reason for Kamran "to join anti-India movement" that TOI seems to suggest is that "Kamran is from a broken family and son of a single mother. His parents were divorced." The plain truth is that Kamran Yousuf is a photojournalist whose work has appeared in local Kashmiri newspapers and international publications as well. He has emerged as one of the best photojournalists from the new talent. 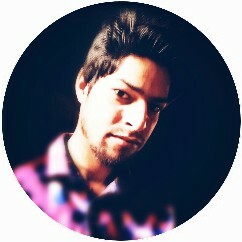 He has been contributing photographs and videos for the last five years now. 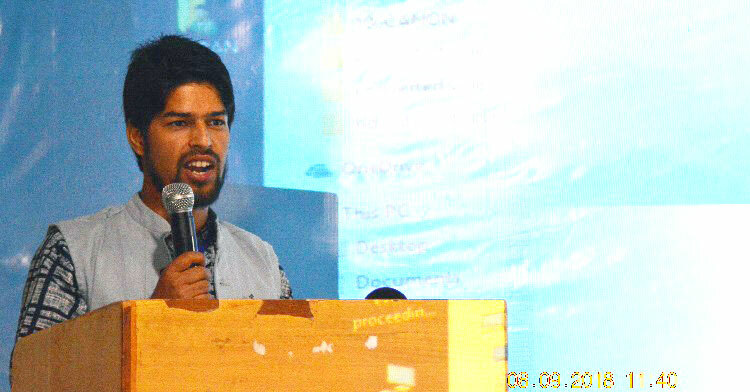 He is presently a stringer with Greater Kashmir and Gulistan News channel. He had even pasted GK logo on his laptop with the passion to work as a full-time photo-journalist with the newspaper. “When I leave in the morning for doing my professional duties, I am not sure if I will return home safe in the evening," Kamran was quoted by With Kashmir recently in an article titled "9 Emerging Photographers From Kashmir". He has been one of the first photojournalists to cover funerals of militants in south Kashmir where other militants would show up. "Covering such a gathering is very tough. I reluctantly take pictures keeping my safety as the priority,” Kamran is quoted in the article. Kamran has been abused and beaten many times by security forces while doing his job. There have been times also when the local people in Pulwama have labelled him as an agent working for the police and blamed him for arrests of many boys. Despite all the hardships, Kamran continued to cover the clashes and subsequent violence from South Kashmir. But NIA arrested him now? How could one believe it even! "A few years ago, Al Jazeera and later VICE News had their journalists and stingers detained by various governments. Instead of leaving their journalists to their fate, they stood by them. In fact, it was only due to the pressure created by the news-organisations, the journalists were later freed by the authorities," reads an article on With Kashmir. A shameful silence is being observed by Kashmir’s news media over his detention. The journalist community must stand together in complete solidarity because journalism is not a crime!